Harry Bullock-Webster was the British Columbia correspondent for The Graphic, a British periodical. Born in Britain in 1855, Bullock-Webster emigrated to Canada and by 1878 worked for Hudson’s Bay Company managing a trading post at Fort Connelly, on Bear Lake in Northern British Columbia. Here he sketched, painted, and drew life in the Rockies, sending this artwork to The Graphic magazine. In 1880 he returned to Britain, where he married a Miss Maud Williamson in 1884. From Britain, he emigrated to New Zealand where he lived until the time of his death in 1942. The fonds consists of ninety-four original watercolours of British Columbian life, mainly of social life, customs, and dress in Hudson's Bay Company posts and along various transportation routes (1874-1880). Sketch book includes four photographs of Fort McLeod, Stuart Lake and the artist. 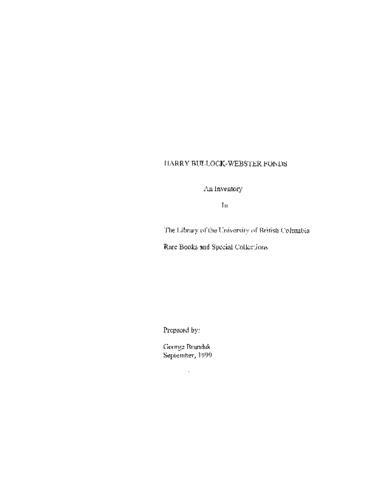 An accrual to the fonds fonds consists of artwork and a published memoir of H. Bullock-Webster. The artworks depict scenes from the daily life Bullock-Webster experienced managing the trade post in Northern British Columbia in the late 19th century. Nine original pieces are included along with ca. 35 clippings of artwork, comics, and illustrations published in The Graphic magazine. The included memoir, entitled, Memories of Sports and Travel Fifty Years Ago: From the Hudson’s Bay Company to New Zealand, contains the author’s account of his young adulthood in Britain, his work for the Hudson Bay Company, and his emigration to New Zealand, along with several illustrations by the author. Materials are in good condition, though some of the prints are fragile, and should be handled with care. University of British Columbia’s Open Collections repository contains digital copies of the first accrual within the fonds available here: https://open.library.ubc.ca/collections/bullock . Photographs of the original watercolours in the first accrual of the fonds were also created as access copies, however the majority of these are stored as slides and negatives, and access to these images is recommended through the digital copies available at Open Collections. RBSC staff created an inventory for the fonds in 1999 (see attached PDF). In 2018 an accrual was made to the fonds, and a finding aid for this has been added as an addendum to the original finding aid, available as attached PDF. Addendum created and finding aid updated by Claire Williams in June 2018.